Most people are very much aware that their smile is going to be the first thing a person notices about them. If your teeth are crooked or misaligned, you might find yourself avoiding smiling just to hide your teeth. One thing to remember is that a smile is inexpensive and an amazing way to let someone know that you care about them and their presence. You can also change your looks and achieve a more beautiful smile by receiving an orthodontic treatment. This type of treatment is specific to straightening and aligning your teeth better. Many people smile to be beautiful, but there are many out there who completely avoid smiling just because they don’t like their teeth. The best way to change your looks is to go for orthodontic treatment and begin to see a change in the way that your teeth actually look. One of the great things about most orthodontic treatment plans is that you may only have to wear your braces for a few months before you begin to see amazing results. Some individuals have to be in braces for years depending on the severity of their teeth and the way that they are currently aligned. With Team Demas Orthodontics, you will receive amazing orthodontic treatment to your own comfort and satisfaction. You choose what type of braces you’d like to wear and treatment can begin when it is most convenient for you. Team Demas is available for consultation, so be sure to contact them and establish an appointment to meet with one of their trained professionals. From there, you’ll find that you enjoy smiling because you are actually proud of the way that your teeth look. Smiling doesn’t have to be painful for those who are dissatisfied with their teeth and the way they look. 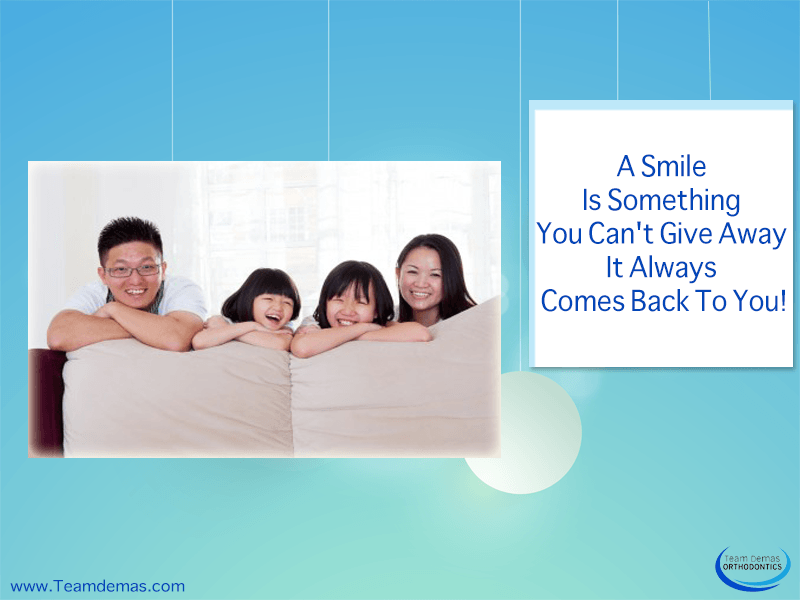 A Smile Is Something You Can’t Give Away; It Always Comes Back To You!